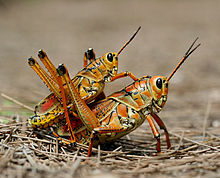 To distinguish grasshoppers from bush crickets or katydids, they are sometimes referred to as the short-horned grasshopper. 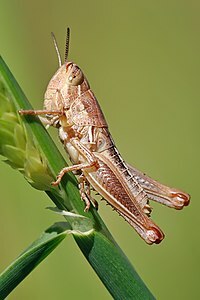 Species which change colour and behaviour at high population densities are called locusts. They are usually collected at dusk, using lamps or electric lighting, in sweep nets. Sometimes they are placed in water for 24 hours, after which they can be boiled or eaten raw, sun-dried, fried, flavoured with spices, such as garlic, onions, chile, drenched in lime, and used in soup or as a filling for various dishes. They are abundant in Central and Southern Mexican food and street markets. This page was last changed on 11 April 2014, at 15:11.